Track day organizers will typically rent out the local road course for a day or weekend, paying the track owner a negotiated fee. Then they’ll turn around and ask the attendees (you) to pay a fee in order to ride that day. The organizer is responsible for running the whole show and making sure everything goes safely, including having an ambulance on site. Depending on the track and day I’ve paid anywhere from $99 to $279, though most southern California track days tend to be around the $150 range. You may also need to pay a small gate fee when you enter the track, maybe $10-$20 per person (that’s the track owner charging you, not the organizer). You do need a track-capable motorcycle. It doesn’t have to be a race bike, but should have a sporting nature. Of course every track day is filled with the usual pack of GSX-Rs, but I’ve also seen plenty of naked bikes, Kawasaki Ninja 300s and even supermoto bikes out there. If you’ve got a bike that’s light and agile, it’s probably gonna do just fine. If in doubt, contact a local track day organizer and ask them about your bike. Pickup trucks – as long as it’s got tie-down loops in the front corners of the bed, you just need a good ramp (do NOT skimp on loading ramps) and a friend or two to help push it up and back it out. One bike is easy; just put it in the center of the bed and use tie-downs in the front. For two bikes, you’ll need to position the bikes carefully so they don’t bang into each other, and run the inside tie-downs through the other bikes’ front wheel. You can use the extra tie-downs to secure the swing arms or rear wheels to the bed to keep the rear from moving around. Trailers – if you have a vehicle capable of pulling a trailer and the patience to drive slower than usual to avoid a ticket, it’s a great option. 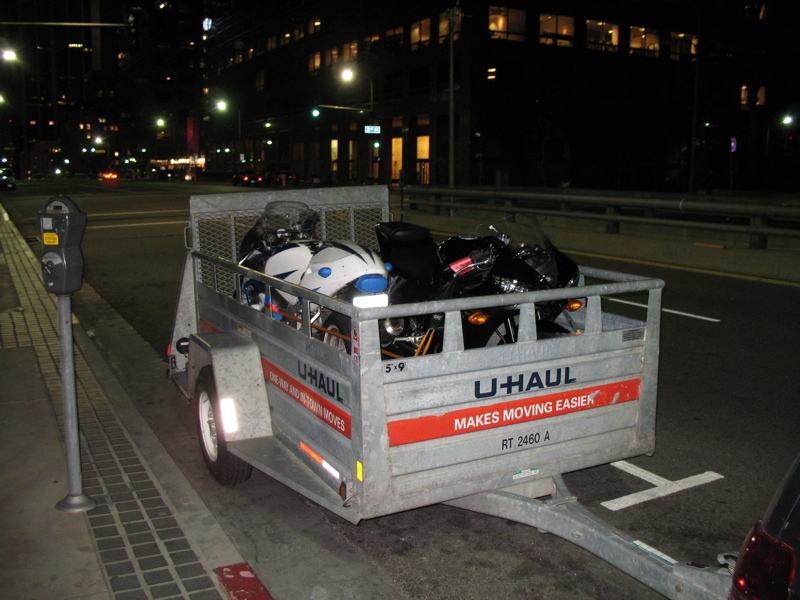 There are many varieties of trailers for purchase or rent, even ones specifically for motorcycles. Just make sure it has tie-down loops and/or a good way to properly secure the bikes. Cargo vans – if you don’t have a pickup truck or something that can pull a trailer, renting a cargo van or Sprinter van is another option. Tying down the bikes is a little tricky though since vans sometimes don’t have tie-down anchors inside, but there’s a way around that. Some riders have built bike anchors using a wooden board and two motorcycle chocks. The chocks are permanently mounted to the board, the front wheels of the bikes go into the chocks, then the bikes can be secured to tie-down loops on the board. The board needs to be reasonably secured to the inside of the van (there are plenty of places to hook tie-downs to), but for the most part it’s not gonna move around much with the weight of the bikes sitting on it. 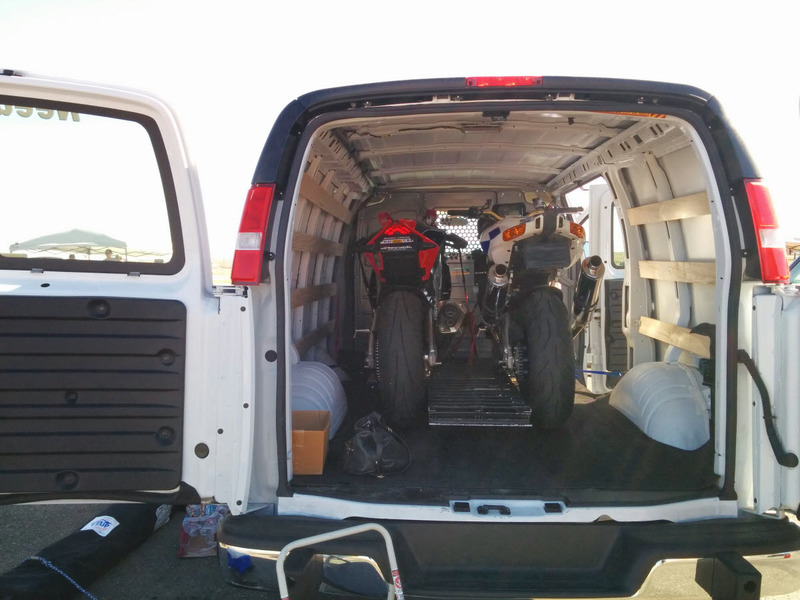 For my first track day I was fortunate enough to have a buddy that was willing to come hang out at the track with me and haul a trailer with my bike in it. I rented a 5×9 ramp trailer from U-Haul (which is awesome because you can just ride the bike right into it) and hooked it to the back of his Jeep Grand Cherokee. 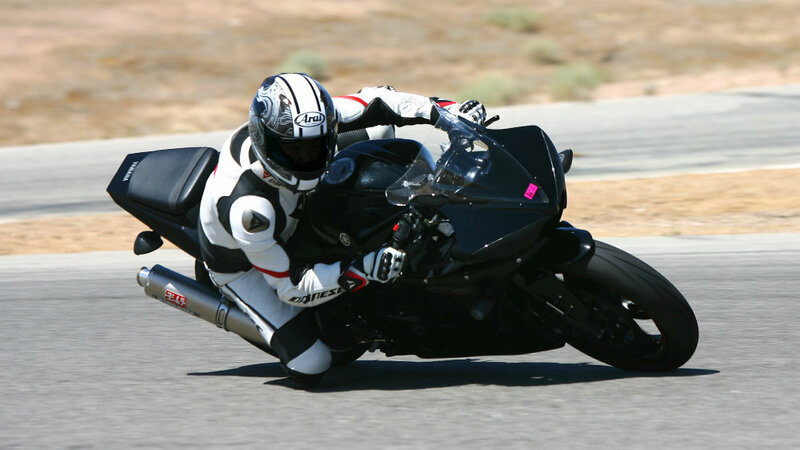 Something else you can do is become a member of a local sportbike enthusiast social media group or forum. Introduce yourself, join some group rides if you’re comfortable doing that sort of thing and meet some people. When a track day gets posted in the events section, make it known you want to go but need help getting to the track. More times than not, someone will be willing to help get you there. The most worrisome question I usually get about track days is, “How much experience do I need?” There is no formula for determining when a rider is ready for track days; one person might be ready after 12 months of riding but someone else might need 24. It was 16 months before I hit the track. When I took Keith Code’s Superbike School last year, there was a 16 year old kid who was comfortable on dirt bikes but had never ridden a sportbike. One thing’s for sure — you need to have unconscious familiarity with your motorcycle’s controls. 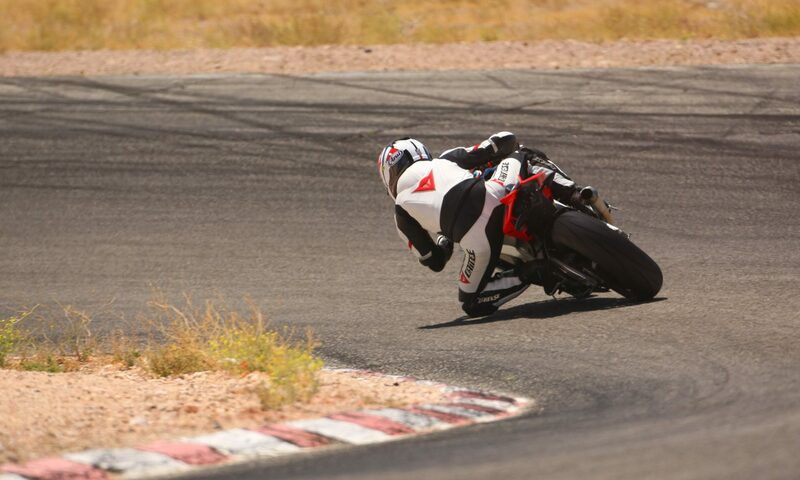 Braking, shifting and leaning your motorcycle into turns should all come naturally. The rest is up to you to determine if you feel like you’re ready to challenge yourself at the track. You’re probably worried about how fast the other riders are at a track day and whether or not you’ll be able to keep up. 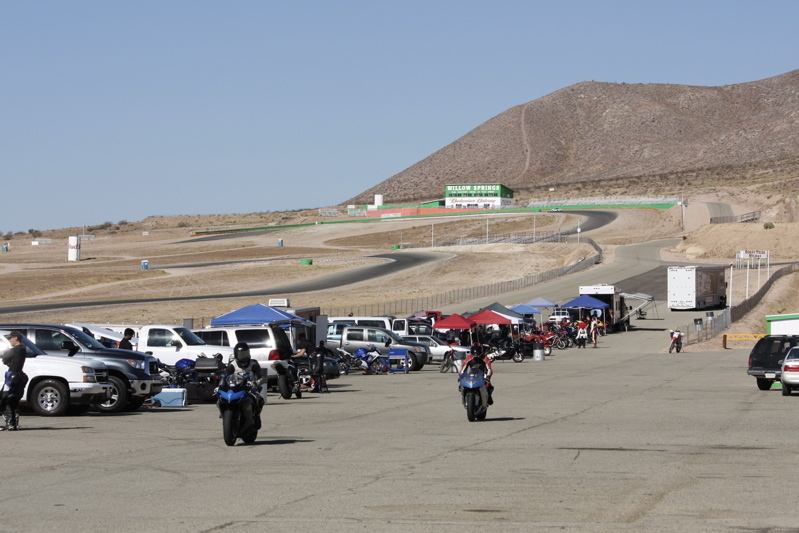 The good news is that all track day organizers split the riders into three groups based on ability, usually labeled A, B and C. The A group is the fastest while the C group is reserved for newer riders or those content to run an easier pace and not push too hard. Each group rides for 20 minutes each hour while the other two groups rest up. Your first track day will be spent in the C group. The typical track day organizer will make an effort to welcome and train riders who are new to the track. At the start of the day, newbies get 2 or 3 orientation laps behind a staff rider so they can get a feel for the track and the proper riding lines. All organizers also have staff that will coach you one-on-one, on and off the track. Definitely take advantage of whatever they offer because it can only help you. As far as getting ready ahead of time, it doesn’t hurt to do a little light reading and get an idea of what it takes to be good at the track. I highly recommend Sport Riding Techniques by Nick Ienatsch. Nick is an excellent writer and accomplished racer; he has written a terrific book that really makes it easy to understand what it takes to be one of the fast people. The book certainly opened my eyes with regard to sport riding and helped me a lot when it came to track days. Arrive as early as possible, find a spot in the pits, unload bikes and set up canopy + chairs + etc. Tire pressure is so incredibly important at the track; over-inflated tires will have reduced grip while under-inflated tires will flex too much and are a disaster waiting to happen. Recommended tire pressures can be quite different for track riding vs. street riding, even on the same tire. If you’re not 100% sure what tire pressure you should be using at the track, talk to one of the track day staff and they will help you out. 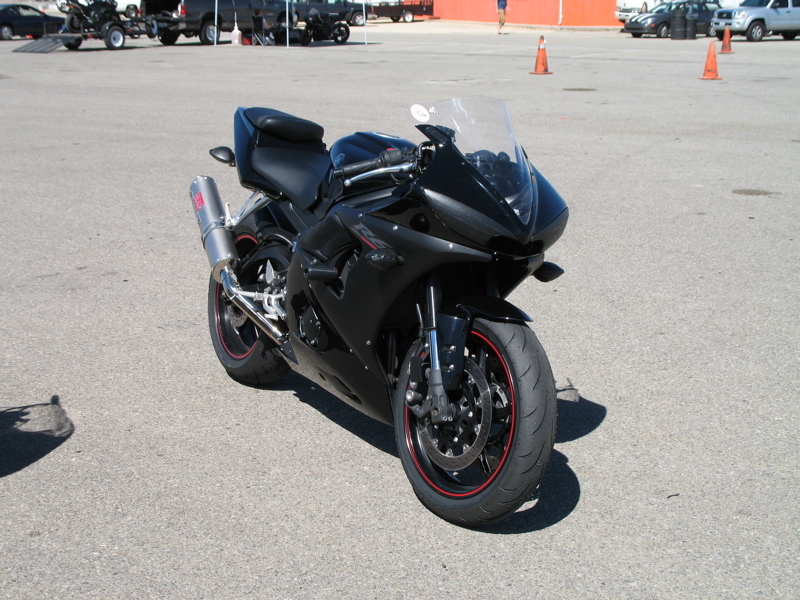 If you have a sportbike or sport-ish bike, get yourself out to the track to see what that thing can really do. Post a comment if you have any questions or use the contact form on the about page and I’ll be happy to answer them if I can. Have fun!